SWING REPUBLIC began life as the side project of a platinum selling Danish songwriter and producer, Per Ebdrup. In love with the sound of swing, Per remixed old and obscure vintage gems in his spare time. 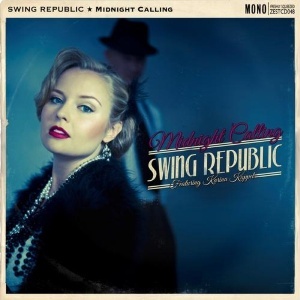 Following the success of the 2010 album 'Electro Swing Republic' Freshly Squeezed Music, (debonairs of all things swing) and Swing Republic are both proud to present the album Midnight Calling. This album is an amazing assortment of all of the best elements of electro-swing. There is an amazing flow between each track with each one as catchy as the last. The album features the stunning vocals of Karina Kappel which lifts the sound and makes the album much more accessible with the catchy melodies and top lines sung by such a well rounded vocalist. The new, highly commercial sound will put them right alongside contemporaries such as CARAVAN PALACE and CARO EMERALD. This is a band to watch in 2013 and beyond. The album also comes packaged in an elegant digipack displaying some of the most eye-catching artwork we have seen in a long time!